Baseline water quality monitoring has been conducted between 29 August and 3 September 2012 at 11 designated monitoring stations (7 Sensitive Receiver Stations, 3 Gradient Stations and 1 Control Station) established for the Project. In situ water quality measurements and water samples were taken at the monitoring stations on three occasions (days), at three depths (surface, middle and bottom) where practical. The intervals between two sets of monitoring were not less than 36 hours. The water quality sampling was undertaken within a 3 hour window of 1.5 hour before and 1.5 hour after mid flood and mid-ebb tides. The tidal range selected for the baseline monitoring was at least 0.5 m for both flood and ebb tides as far as practicable. No major activities influencing water quality were observed in the vicinity of the Project’s marine works area during the baseline monitoring. Water quality monitoring results are, therefore, considered to be representative for the baseline conditions of the areas where marine works will be undertaken for the Project. In accordance with the EM&A Manual, the baseline monitoring results were used to determine the Action and Limit Levels for Dissolved Oxygen (DO), Suspended Solids (SS) and Turbidity for the impact water quality monitoring which will be conducted during marine works of the Project. The Action and Limit Levels are summarized in Table 1 below. 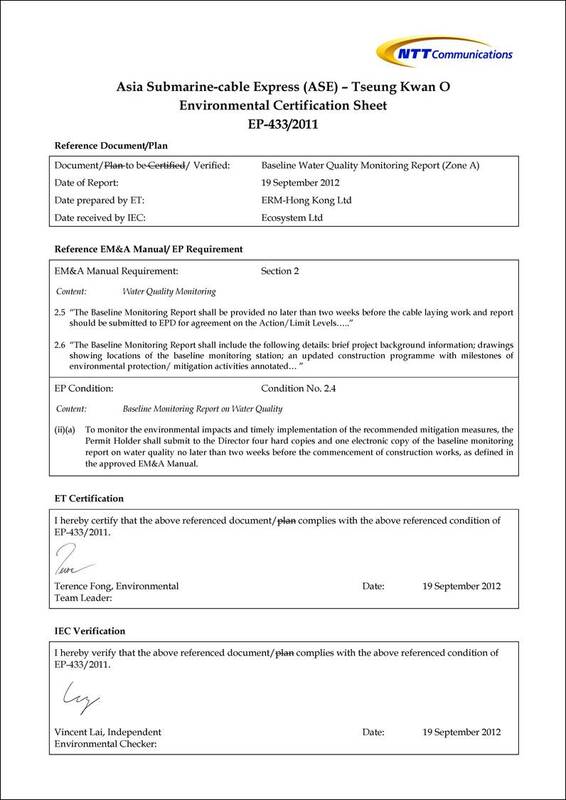 Pursuant to Condition 2.4 of the EP, an environmental monitoring and audit (EM&A) programme as set out in the Environmental Monitoring and Audit Manual (M&A Manual) is required to be implemented. In accordance with the EM&A Manual, baseline monitoring of marine water quality should be undertaken for the Project. 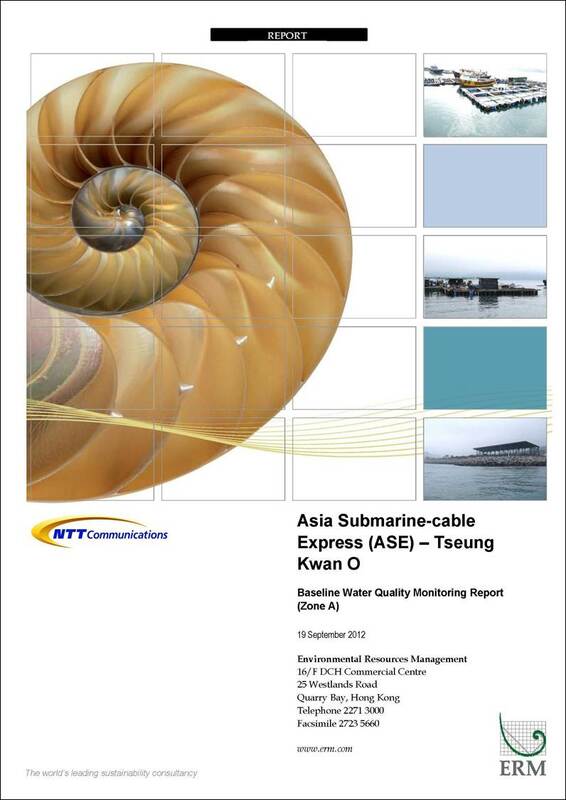 This Water Quality Baseline Monitoring Report (“the Report”) is prepared by ERM-Hong Kong, Limited (ERM) on behalf of NTT Com Asia (NTTCA) to present the methodology and findings of the baseline marine water quality monitoring for the Project. Given that the water sampling stations in Zone A are situated quite far away from those in Zones B and C, and the commencement dates of construction in each zone are also different, it is recommended to present the baseline data in separate reports (i.e. Part A for Zone A, Part B for Zone B and Part C for Zone C) and the corresponding Action and Limit Levels will be derived from the baseline data for each zone. The purpose of this Baseline Water Quality Monitoring Report (Part A) is to determine the baseline marine water quality at the designated monitoring locations around the Project works area in Zone A prior to the commencement of the cable laying works of the Project. Such baseline conditions will be used as the basis for assessing water quality impacts, if any, and for compliance monitoring during the construction of the Project. Under the requirement of Condition 2.4 of the EP, the baseline monitoring report on water quality shall be prepared and submitted to the DEP no later than two weeks before the commencement of construction works of the Project. Summarize the water quality monitoring locations and frequency, monitoring methodology and baseline monitoring results, and establishes the Action and Limit Levels in accordance with the EM&A Manual. Conclude the representativeness of the baseline monitoring results and observations for the Project. Baseline water quality monitoring in Zone A was conducted prior to the commencement of cable laying works at the monitoring stations listed in Table 2.1 and shown in Figure 2.1. Table 2.2 summaries the equipment used for the baseline water quality monitoring. The water monitoring was carried out on three occasions (days) and the intervals between two sets of monitoring were not less than 36 hours. The water quality sampling was undertaken within a 3 hour window of 1.5 hour before and 1.5 hour after mid flood and mid-ebb tides. The tidal range selected for the baseline monitoring was at least 0.5 m for both flood and ebb tides as far as practicable. Reference were made to the predicted tides at Tai Miu Wan, which is the tidal station nearest to the Project Site, published on the website of the Hong Kong Observatory (). 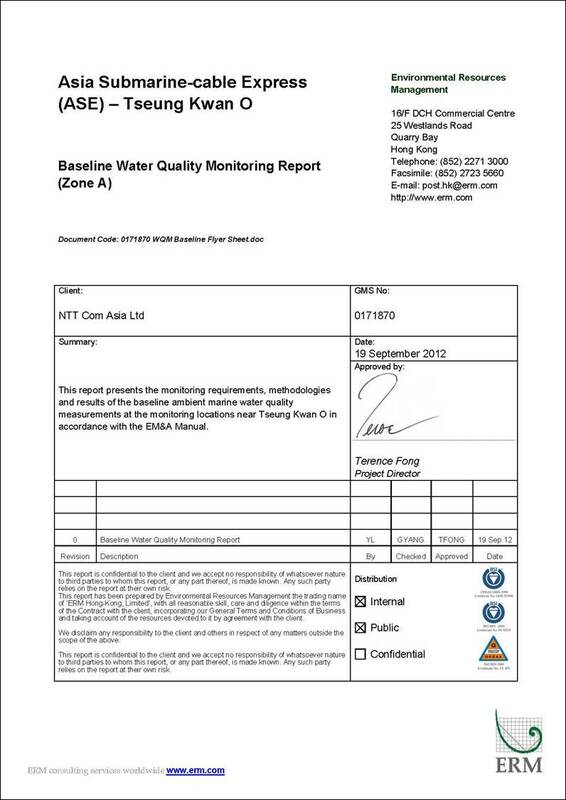 Based on the predicted tidal levels at Tai Miu Wan, the baseline water quality monitoring was conducted between 29 August and 3 September 2012, following the schedule presented in Annex A. Schedule for baseline monitoring has been submitted to the Contractor, Independent Environmental Checker (IEC), Engineer Representative (ER) and Environmental Protection Department (EPD) one week prior to the commencement of the monitoring works. All in situ monitoring instruments were checked, calibrated and certified by a laboratory accredited under HOKLAS or any other international accreditation scheme before use (see calibration reports in Annex B), and subsequently re-calibrated at-monthly intervals throughout all stages of the water quality monitoring. Responses of sensors and electrodes were checked with certified standard solutions before each use. 3 replicate samples were collected from each of the monitoring events for in situ measurement and lab analysis. The monitoring data and graphical presentations for baseline water quality monitoring are provided in Annex D. No marine construction activities were observed in the vicinity of the monitoring stations during the baseline monitoring. No other major activities influencing water quality were identified during the monitoring period, and weather conditions were generally calm during the baseline monitoring period. The Action and Limit Levels have been determined based on baseline water quality monitoring data for all monitoring stations in Zone A. The results are presented in Table 2.4. Please note that the results are used to determine the Action and Limit Levels for the cable laying works to be undertaken in Zone A.
Baseline water quality monitoring in Zone A has been conducted between 29 August and 3 September 2012 at 11 designated monitoring stations (including 7 Sensitive Receiver Stations, 3 Gradient Stations and 1 Control Station). The monitoring was conducted out in 3 days, at mid-flood and mid-ebb tides, at three depths (surface, middle and bottom). The intervals between two sets of monitoring were not less than 36 hours. During the monitoring period, no major activities influencing water quality were observed in the vicinity of the Project’s marine works area. Water quality monitoring results are, therefore, considered to be representative of the baseline conditions of the areas where marine works will be undertaken for the Project. The baseline monitoring results were used to determine the Action and Limit Levels for the DO, SS and turbidity for impact monitoring to be conducted at Zone A throughout the construction phase of the Project.